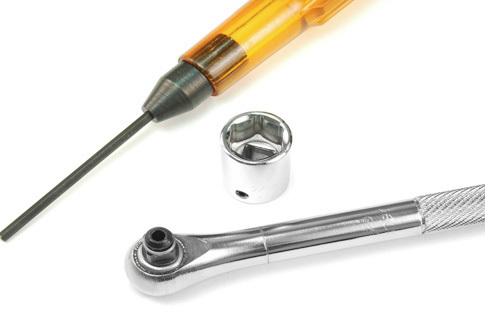 Hi-Lok And Hi-Lite Installation Ratchet Assembly from Omega Technologies includes: 5/16'' Socket, 5/64'' Hex Key. This is a hand tool assembly for the installation of the Hi-Lok or Hi-Lite fastening systems. It consists of a Roller Ratchet wrench with a through hole, a socket, and a plastic handle Allen wrench. The through hole in the ratchet allows for the insertion of an Allen key. While any Allen key style may be used in conjunction with the ratchet, a plastic handle or a T handle Allen wrench with a replaceable blade is furnished. The socket is held to the square drive with a set screw, eliminating FOD. Hi-Lok and Hi-Lite Installation Ratchet Assembly includes: 3/16'' Socket, 1/16'' Hex Key. Hi-Lok and Hi-Lite Installation Ratchet Assembly includes: 7/32'' Socket, 1/16'' Hex Key. Hi-Lok and Hi-Lite Installation Ratchet Assembly includes: 1/4'' Socket, 1/16'' Hex Key. Hi-Lok and Hi-Lite Installation Ratchet Assembly includes: 9/32'' Socket, 1/16'' Hex Key. Hi-Lok and Hi-Lite Installation Ratchet Assembly includes: 5/16'' Socket, 1/16'' Hex Key. Hi-Lok and Hi-Lite Installation Ratchet Assembly includes: 11/32'' Socket, 1/16'' Hex Key. Hi-Lok And Hi-Lite Installation Ratchet Assembly includes: 7/32'' Socket, 5/64'' Hex Key. Hi-Lok And Hi-Lite Installation Ratchet Assembly includes: 1/4'' Socket, 5/64'' Hex Key. Hi-Lok And Hi-Lite Installation Ratchet Assembly includes: 9/32'' Socket, 5/64'' Hex Key. Hi-Lok And Hi-Lite Installation Ratchet Assembly includes: 5/16'' Socket, 5/64'' Hex Key. Hi-Lok and Hi-Lite Installation Ratchet Assembly includes: 11/32'' Socket, 5/64'' Hex Key. Hi-Lok and Hi-Lite Installation Ratchet Assembly includes: 3/8'' Socket, 5/64'' Hex Key. Hi-Lok and Hi-Lite Installation Ratchet Assembly includes: 5/16'' Socket, 3/32'' Hex Key. Hi-Lok and Hi-Lite Installation Ratchet Assembly includes: 11/32'' Socket, 3/32'' Hex Key. Hi-Lok and Hi-Lite Installation Ratchet Assembly includes: 3/8'' Socket, 3/32'' Hex Key. Hi-Lok and Hi-Lite Installation Ratchet Assembly includes: 7/16'' Socket, 3/32'' Hex Key. Hi-Lok and Hi-Lite Installation Ratchet Assembly includes: 3/8'' Socket, 1/8'' Hex Key. Hi-Lok and Hi-Lite Installation Ratchet Assembly includes: 7/16'' Socket, 1/8'' Hex Key. Hi-Lok and Hi-Lite Installation Ratchet Assembly includes: 7/16'' Socket, 5/32'' Hex Key. Hi-Lok and Hi-Lite Installation Ratchet Assembly includes: 1/2'' Socket, 5/32'' Hex Key. Hi-Lok and Hi-Lite Installation Ratchet Assembly includes: 1/2'' Socket, 3/32'' Hex Key. Hi-Lok and Hi-Lite Installation Ratchet Assembly includes: 1/2'' Socket, 1/8'' Hex Key.